5 DCA and Multi lingual DTP. NCPUL (South Region Branch, Hyderabad)– Ministry of HRD – Govt. of India). 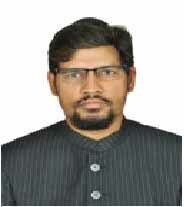 1 Dr. Abulkalam Choudhri Ph.D Image of Women in the Novels of Yusuf Idris. 2 Dr. Syed Ifteqar Hussain Ph.D. Essay Writing of Ali Tantavi and Abul Hasan Ali Nadwi: A Comparative Study. 3 Dr. Shamim Nizami Ph.D Contribution of Darul Uloom Deoband to Arabic (1980 – 2010). 4 Dr. Mohd Rafeeque Ph.D Muhammad Rajab Al-Bayoumi and his prose work: A Critical Study. 5 Dr. Mohd Rashid Ph.D. Ismail Fahd Ismail: A Fiction Writer. 6 Mr. Ikhter Ali Ahmed Ph.D. Anwar al Jundi: An Icon of Biography Writing in Modern Arabic Literature. 7 Mr. Md. Shamim Nizami M.Phil Indian Council for Cultural Relations and the Promotion of Arabic. 9 Mr. Mohd. Rashid M.Phil Social and Political Issues in the Essays of Syed Mohammed Wadih Rasheed Nadwi. 10 Mr. Muhammed Nishad K Ph.D. Western Civilization in the Writings of Mustafa Sadiq Al Rafaee and Mustafa Lutfi Manfaluti: An Analytical Study. 11 Mr. Younas Saleem K Ph.D. Representation of Palestine Imbroglio in the Poetry of Palestinian Female Poets. 12 Mr. Basharat Ahmed Shaheen Ph.D. Shouqi Zaif and History of Arabic Literature – An Analytical Study.